iBall has launched a variety of easy used mobiles with the name “Shaan”, which can easily be used by any people in the world. These iBall mobiles are made up of fine designs with the menus placed in the perfect places. These mobiles are available at an affordable range that you can spend for resolving your daily far away conversations within a short span of time by calling for few minutes through the mobiles. The iBall Long B261 mobile can be the best choice for the first time users who have hardly used mobiles earlier as the menus are very easy to be handled and one you don’t need to take much time in order to learn the handelling of the menus. There are many young and old customers who have bought this one from us and have easily learnt the use of the mobile. A lot of attributes are present in the mobile that makes it a good mobile bought at a moderate budget. The mobile looks very cool, brushed in white color. It has a broad and bright display screen. GPRS and WAP Browsers are available in the mobile and you can access many data with the help of Bluetooth and USB. There are Dual Cameras in the mobile for which you will enjoy to full extent in capturing good quality of images and video recording. There is MP3 Ringtones and FM Radio in the phone so you are sure to get enthralled with a good music system in the mobile Phone. The uniquely designed iBall Gracia is a set from which you cannot take your eyes off as it is made up do good quality of material that can withstand small blows and falls. The mobile has a glossy screen that has a brilliant screen and so the texts, pictures and videos appear vividly on the screen. It is a light weighted and slim mobile having all the basic features. The keypad is very smooth and works in a fine way along with the other features. The Bluetooth connection is fine as the mobile connects at a faster rate with the other mobiles. The hunt for the music lovers does not only ends here but also can go on for FM Radio that will entertain you all music enthusiasts with non stop musics. The battery of the mobile is of standard quality for which you can carry on with the works that you need to without any disturbance. There are games that are of fantastic graphics, which will entertain you at your leisure hours. There are two very low ranged mobiles in this category that has the standard features. The Dark Silver Chocolate colored iBall S-315 looks stunning with a new design and is a brilliant mobile as this stores a lot of attributes in it. The iBall mobile has a 8 GB memory , where you can store a great deal of data that you need to store. There is a built-in digital camera with digital zoom and a Radio FM, which will entertain you at the times when you are not in mood to work. The other one, that is, the iBall S- 207M is another pocket saving mobile for you from the iBall company that again stores a bundle of features like a 8 GB memory, Games, GPRS and Browsers, Bluetooth and Radio FM. The Camera looks very smart in Black and Silver colors. 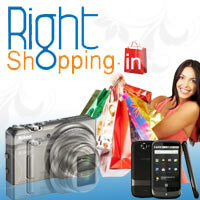 You can get the details of the mobiles in our website www.rightshopping.in where you can get through them. You can order for the products of your choice by visiting the above sites and can have your ordered products at the right place in India and that too within the given period of time.